During the first half of the 20th century, the city of Chicago was shaped and reshaped by waves of migration and immigration as African Americans poured in from the South and newcomers arrived from Europe and Mexico. They Seek a City, a 2013 exhibition at the Art Institute of Chicago, focused on the art produced by the diverse communities that made Chicago their home. Over 80 works primarily by southern- and foreign-born artists—many rarely seen by the museum’s audiences—were on display for this look at the city’s rich art of migration, as Chicago became the polyglot, cosmopolitan place that it remains today. Six million African-Americans moved from rural Southern United States to the Northeast, Midwest, and West during the 20th century. Between 1910 and 1970, blacks moved from 14 states of the South, especially Alabama, Louisiana, and Mississippi. Highlighting this diverse yet interwoven artistic production, They Seek a City includes paintings, works on paper, photographs, sculpture, and decorative arts from local cultural institutions and private collectors as well as from the permanent collection of the Art Institute. 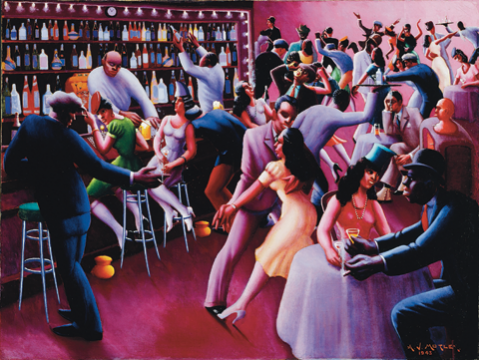 By examining the art of the city through the lens of migration, the exhibition not only traces Chicago’s rich and dynamic cultural development but also explores some of the most important social and artistic questions of the early 20th century, including the intersecting issues of racial and cultural identity.